We are quickly approaching the holiday season. The beginning of school rush is over but our nights are still packed. 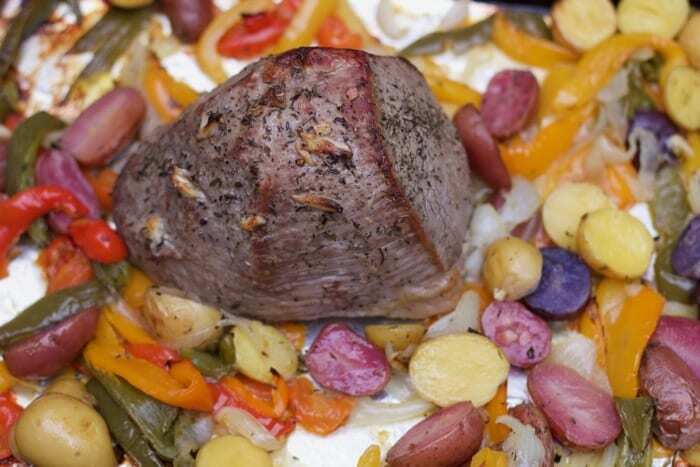 Sheet pan dinners like this Roast Beef with Vegetables is not only a hardy meal but the leftovers are even better for busy weeknight dinners. Like most of us we have very busy days and the last thing I want to do at night is wash a bunch of dishes after a meal. 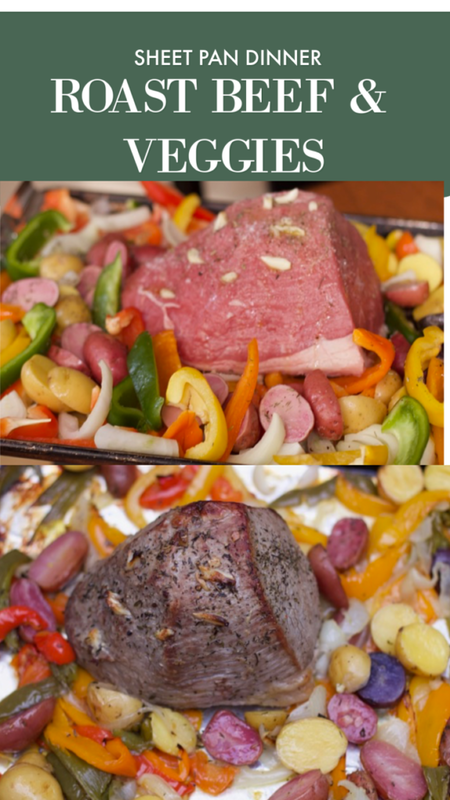 When I saw this recipe in an Everyday Food Show a couple of years ago, I could not resist trying a meal that you cook your veggies and main course in one pan and in about 1 hr! Sheet pan meals are quick and easy and don’t take very long to assemble. 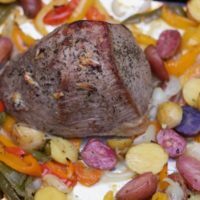 This roasted beef recipe is a family favorite but you can substitute any other veggies your family will eat. The best part of this Roast Beef recipe is if it you don’t eat it all in one sitting, save some extra meat for sandwiches the next day. If you have extra veggies leftover you can make them into fajitas or a Roasted Vegetable Frittata Recipe for another meal. I love meals that you can turn into two completely different dinners. Your family will think you are a rock star. We went with the mixed potatoes this time and used four different peppers. You are in control of this recipe and buy what your family will eat and what is priced right. Love that the only thing I need to clean up is a baking sheet! Preheat oven to 400 degrees. 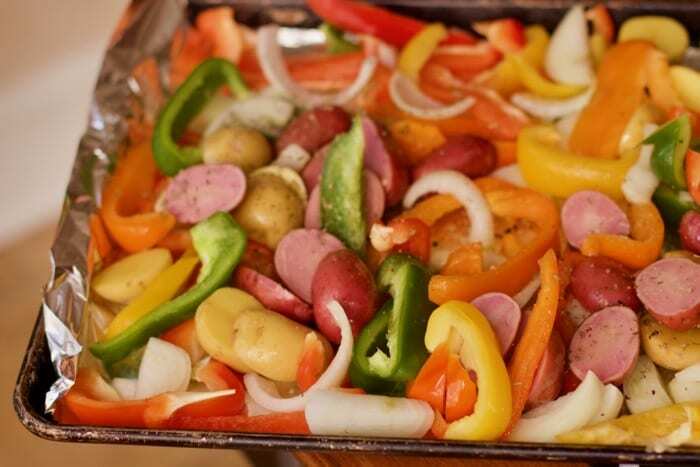 Place peppers, onions, potatoes, and whole garlic cloves on a large rimmed baking sheet. Drizzle with half the oil, season with salt and pepper, and toss to coat. Using a paring knife, make 12 small slits in top and sides of roast; push in garlic slivers. Move vegetables to sides of sheet. Place beef in center, and coat with remaining oil; rub all over with 1 1/2 teaspoons coarse salt, 1/2 teaspoon pepper, and thyme. 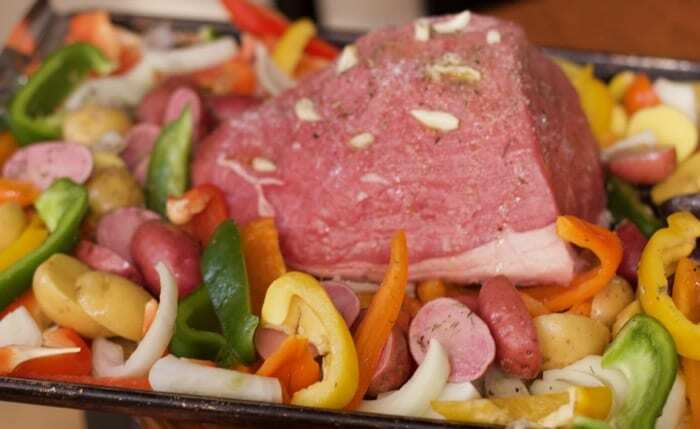 Roast 40 to 50 minutes, tossing vegetables occasionally, until tender and an instant-read thermometer inserted into thickest part of beef registers 130 degrees for medium-rare. Let meat stand 10 minutes, loosely tented with aluminum foil to keep warm. Cut half into very thin slices (reserve remaining half for leftovers). Serve with vegetables. Cool remaining beef to room temperature; place in an airtight container, or wrap in plastic, and refrigerate. Be sure to pin this for your next weeknight meal. Sheet pan dinners are my new favorite.